Ximango UK are based with us. 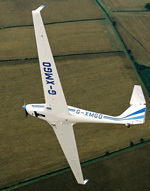 The demonstrator, G-XMGO, is kept in our hangar and is available for flights with prospective customers, by arrangement. The Ximango website is currently under construction. For more information and prices, please contact us.